We are currently in the midst of the longest government shutdown in history. So of course, in the interest of science, we asked our resident comedic confrontational columnists what they thought about it. The current federal government shutdown is wreaking havoc across its various branches. Between the Coast Guard, NASA, and everything in-between, civil servants are either trudging forwards with their work without compensation or being furloughed, a somewhat silly sounding word to say that they’re temporarily out of a job. Obviously, such a prolonged shutdown would cause controversy on a national scale. Many have been clamoring for the government to resume normal activities, but I ask you, dear reader, is this truly the best course of action? In a word: no. In several words: the current government shutdown is the most ingenious environmental preservation maneuver in the history of the United States. Now let’s take a moment to review some of the most divisive issues this past year in politics. There have been several headline-grabbing stories throughout 2018, from immigration laws to new social movements. However, the biggest issue was and is most definitely climate change; it affects not only every human on Earth, but every animal, plant, and protist on the face of this planet. And one of the most significant events in climate change for the United States, at least, was the decision of the country to withdraw from the Paris Agreement, an international governing regulations surrounding greenhouse gas emissions in signatory countries. Now, this move shocked a lot of people. There were a lot of angry dissenters who thought this might be an outrageous move in order to loosen climate laws within the States so that coal and oil companies could make a few extra bucks. However, I think what they’re all missing is the big picture. You see, the withdrawal from the Paris Agreement was only the beginning; the first step in a grand scheme not to increase carbon emissions, but exactly the opposite. Sure, it seems counterintuitive at first. Why would the government pull away from regulations designed to combat environmental degradation in an attempt to reverse it. It’s simple: the US’s long history of American pride. The United States have never played by anyone else’s rules. The colonists didn’t like being under British rule, so they made their own country. It was the Americans who proposed founding the League of Nations after World War I and then didn’t even join it themselves. Even President Eisenhower said trains are stupid and built a ton of highways instead. And now, the United States is withdrawing from the Paris Agreement because we don’t play by anyone else’s rules; we’re going to save the Earth our own way. Since then, the President has been planning, fine-tuning this master plan to stop climate change—global warming, rising sea levels, all of it—in one swift motion. And we’re now finally seeing the results of this hard mental labor in the shutdown of the government itself. How does this help anything? Because, you see, the government is not a very efficient mechanism. In fact, between the bloated bureaucracy and inflammatory infighting between those who run the nation, the US Federal Government is much like an incandescent light bulb. It is old, dusted, and burns a lot of resources producing heat when people really just want some light in the dark. By turning off this light, the United States is saving a lot of costs in energy. The electricity demand of powering lighting systems, heating offices, and monitoring security that would normally be produced through coal-fueled power plants of gas-hungry generators is now no more. There are fewer cars spewing harmful carbon emissions on the road now that a good portion of DC no longer needs to commute to and from work throughout the day. Meanwhile, the “essential” components of the system still at work shuffle along like a lean, mean governing machine. In fact, this is a move so well-crafted and approachable that the reasoning can be condensed to such a level that even children can understand: turn off the lights when you’re not using them. As more and more of this country becomes streamlined in its energy needs, it will slowly reach a point where it is able to sustain its power demands through existing renewable technologies alone. This great nation of United States will become “greener” than it was before the industrial revolution of over two hundred years past. Truly, we’re on the cusp of a magnificent efficiency revolution, and there will likely be turbulent times ahead as the country leads the charge into an environmentally conscious future. So should we turn the government back on? No, I think we should leave it off and trust in our country’s leaders as we’re LED into the brighter, eco-friendly destiny that awaits. We live in the Information Age, and everywhere we turn we are met with screens, computers, speakers, flashing lights, and other pieces of modern magic we call “electrical engineering”. Of course, nothing is perfect and sometimes the hamsters running around in that little wheel inside the computer get tired and just stop. This starts an ancient invocation of computer engineering called the “blue screen of death”, which is just a fancy way to say that one of Cthulhu’s minions possessed the computer and caused it to seize up and stop working. Our government has recently acted in very much the same way, and we’ve ignored all the symptoms. I’m not talking about some runny nose either, where you hold a thermometer under a light bulb to prove to your parents that: yes, my temperature is 122°F, and yes, I cannot go to school today because on all accounts, I should have died 14°F ago. I’m talking about the real deal, where the government got so sick that it just fell into a deep coma. Not only that, but all the hamsters powering the bureaucracy fell asleep, and their wheels broke off the generator crankshaft. Long story (and long medical bills) short, the government shut off. Now, I’m not going to get into the reasons behind the shutdown, although I have my suspicions about the hooded figures entering and leaving the White House in the middle of the night, and the weird moving lights circling above the Senate building, or the Supreme Court and their… well, they haven’t done much recently, but I’m sure they’re up to something nonetheless. My point is that we ought to just turn the government back on. Just like your home computer, sometimes a good old fashion reboot is all that’s required to repair the issue. Thanking about it, it makes sense. I was more confused why no one had tried it yet than anything else. However, rebooting and thus repairing the government requires actually turning it back on again. So then, what’s the issue? Clearly, some people got way too excited to rob some vending machines and commit some insurance fraud for free after watching The Purge, and they wanted to do the same thing by taping over the power button for Washington. To be honest, keeping the government shut off like in The Purge would be exciting, and I know that I would break the law of gravity, or a more serious offense like eating food in the Commons. However, after the third day or so it would start to become a bit scary out and it would be nice to have some law and order returned to society. As tempting as anarcho-capitalism might sound, walking out the door to a scene reminiscent of World War I everyday doesn’t sound like my cup of tea. 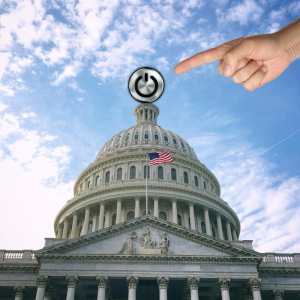 Clearly, the government shutdown is due to some minor software error in the system, and a simple reboot would fix all the issues. It is my hypothesis that it has to do with the recent software update to House of Representatives last November, but what matters now is to turn the government back on so it can continue delivering the mail or declaring proxy wars or whatever it does.